The US Republican Party has apologised to Hindus after an advertisement meant to woo them ended up offending instead. The ad, published to celebrate a Hindu festival for the elephant-headed deity Ganesha, also included the political message: "Would you worship a donkey or an elephant? The choice is yours." The donkey is the political symbol for the Democrats while the elephant is the symbol for the Republicans. The Hindu American Foundation (HAF) called the ad "problematic". It asked the party's branch in Texas's Fort Bend County, which published the ad in a local newspaper, for clarification. 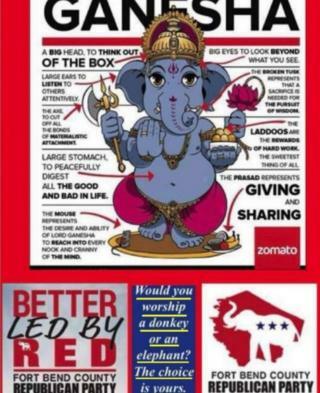 "While we appreciate the Fort Bend County GOP's attempt to reach out to Hindus on an important Hindu festival, its ad — equating Hindus' veneration of the Lord Ganesha with choosing a political party based on its animal symbol — is problematic and offensive," said HAF Board Member Rishi Bhutada in an official statement. Many other Hindus shared the ad on Twitter and asked the party to retract it. In response to the outrage, the party said that the ad was "not meant to disparage Hindu customs or traditions". "We offer our sincerest apologies to anyone that was offended by the ad. Obviously, that was not the intent," Jacey Jetton, chairman of the Fort Bend County Republican Party told local reporters. Soon after the party released its apology, the HAF updated their statement accepting the apology. "How they plan to not make a similar mistake in the future in their outreach to the Hindu community, and all communities in Fort Bend, remains an open question," Mr Bhutada said.